Miata 4x100 bolt pattern 16x8 rims made to fit! These are a personal favorite for their combination of great quality, great finish, strength, lightness and price. This is a special order offset 16x8 for Good-Win Racing for the turbo and supercharged and V8 and other Miata owners looking for LOTS of Miata grip! We challenge you to find any other 16x8 this LIGHT WEIGHT and this strong for this price. This 14.8 pounder uses rolling rim technology for forged-like strength. Note that Enkei does not make a center cap for the 15 inch size but does for this 16 inch size but it is NOT included (we have them separately on the website). In stock! Takes a standard 73/54 hubcentric ring. 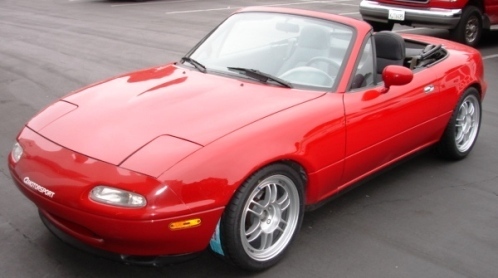 Mazda trusts Enkei to make the factory Miata rims...which makes Enkei wheels the perfect choice for your larger than stock Miata wheels. To see LARGER PICTURES of this combo click your way into our Forum "Wheel and Product Picture Gallery" and see the RPF1 thread.